Getting a WiFi connection is a major concern once you are addicted to the web and mostly in the online world. When we hear the term hack, it strikes in our mind that it is the job of a high-end technology guy or a hacker. But to “hack WiFi password”, you don’t need to be a skilled technologist because even a non-technical guy can do it with some tricks and methods. How to hack WiFi passwords using Android? Besides using your computer, you can also use your Android device to hack a WiFi passcode. In this process, you can hack WPA2 WPS Routers, but make sure that your Android phone is rooted and consists of Cyanogen ROM. Download and install bcmon to get assisted in monitoring mode in your Broadcom chipset and avail PIN cracking. Launch the app > Tap on the ‘monitor mode’ option. Download and install Reaver app to crack the WPS Pin and retrieve the WPA2 Passphrase. Launch the app and confirm the action provided on the screen. Verify your settings and ensure that you checked the Automatic Advanced settings box. Begin the hacking process by tapping on ‘Start Attack’. It will take approximate 2-10 hours for the cracking process to complete. How to get WiFi password with Penetrate Pro? Penetrate Pro can decode WEP/WPA keys for numerous routers like Discus, BBox, Thomson, Orange, BigPond, etc. Though the app is not available in the Play Store due to changes in policies, you can download the apk file from Penetrate_pro_v2111_android.apk. On accessing the app, your anti-virus might detect this application as a virus, so simply ignore it to prevent any affect in your phone. Download and install Penetrate Pro. Launch the application and you will find the window displaying the available WiFi networks. Enable the option ‘Get keys from the web’ by going to Settings. If you got a reversible router and tap on the network to obtain the WiFi keys. Tap on the key to copy it and open WiFi menu to connect with the code. WPS Wireless Scanner is an Android app and a simple way to break WiFi password by scanning the wireless networks with WPS filters. The application scans for the nearest WiFi connections with different modes like normal scan, fast/slow scan, turbo scan, etc. and displays the network status with detailed information. You can find the open WiFi networks and access them by clicking on the open network. Install WPS Wireless Scanner on your Android device. Launch the app and it will automatically scan for the WPS wireless networks. Click on the network that you want to hack. Note down the eight digit PIN provided. Open your PC/laptop and enter the eight-digit PIN in the password field. You have successfully cracked the WiFi network. 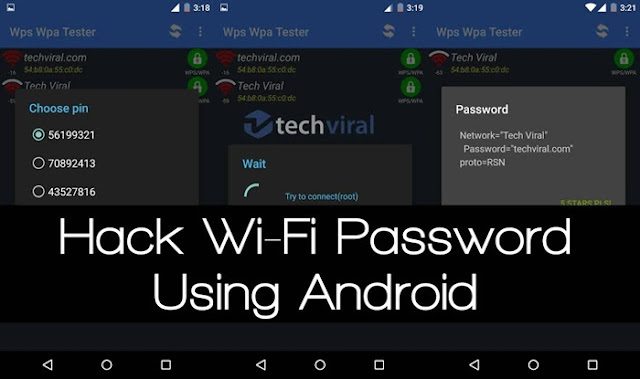 WPS Wireless Scanner is an effective WiFi password cracker that can be downloaded from the Google Play Store.